Section 1 -- Name: The name of the organization shall be Partimus. It shall be a nonprofit organization incorporated under the laws of the State of California. Section 2 -- Purpose: is organized exclusively for charitable, educational purposes. Partimus is a registered 501(c)3 non-profit in the United States, EIN # 20-5033488. See our donate page for how to donate. Christian Einfeldt, our Executive Director, is an advocate of Free Open Source Software and has been using various flavors of GNU-Linux since 2000. As a level one administrator, he troubleshoots basic technical problems that the users are experiencing and teaches them the skills necessary to feel more comfortable with OpenOffice, TuxMath, TuxType, and numerous other applications that run on Linux. 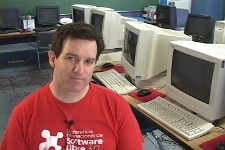 Christian has been helping schools use GNU-Linux since 2004. 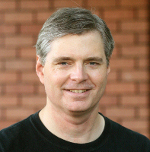 Grant Bowman brings 24 years of professional Internet experience in roles such as founding Director of Silicon Valley Public Access Link (svpal.org), IT Manager, Sr. Systems Engineer and Consultant in large corporate environments like Bank of America, Adobe and SuSE Linux, Inc. as well as agile startup and open source project environments. Mr. Bowman is an elected leader of ubuntu-us-ca, a recognized Ubuntu Member, an olpcsf.org contributor, and a Fedora Ambassador. During 2011 he taught in Nairobi, Kenya with Dreamfish. An increased technical capability has brought an increased appreciation for the value of learning in effective computer ecosystems. 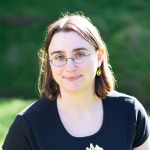 Elizabeth Krumbach Joseph, our Treasurer, has been involved with coordinating Linux community groups since 2003 and spent six years as a member of the Ubuntu Community Council. Some of her work early within Ubuntu focused on coursework development for in-classroom and internet-based teaching materials for learning to use Ubuntu, spent time as one of the leaders of the Ubuntu Women project which sought to get more women involved with and using Ubuntu and has long been a leader in the Ubuntu California community. In 2012 she spent time in Ghana with Computer Reach, working with a local NGO to deploy Linux-based desktops to schools. She currently works in San Francisco for a tech startup. "Receiving positive feedback from schools and getting to see pictures of the kids actually using the machines is what keeps me going. Even when the situation changes at a school which causes our support to come to an end, I sleep well at night knowing that while we were there in the school, we helped some children gain access to free and open technology. It's also been great to have conversations with others who are doing similar things or are planning to, I did a talk at the SCaLE10x conference in 2012 about my experience with Partimus which spurred lots of great discussions at the conference and fostered ongoing relationships." Beth Lynn Eicher, our Organizational Consultant, is also the treasurer and founder of the Ohio LinuxFest Corporation. She brings over seven years of non-profit and volunteer management for Free Software causes. Ever since her research internship at Pittsburgh Supercomputing Center in 1999, she has been committed to the proliferation of the Linux desktop. 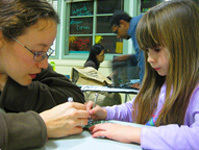 In 2002, she deployed for the first Linux desktop classroom at Carnegie Mellon School of Computer Science. Today she is a senior Linux systems administrator at a large privately held corporation. With a passion for computer recycling, she co-founded freelinuxbox.org, a site that finds homes for functional systems. James Howard has worked as an GNU/Linux professional for over 10 years and in the nonprofit space since 2003. His focus with Partimus has been on research and development, systems deployment, and providing technical guidance and support to Partimus clients. He is responsible for building and maintaining core technology infrastructure deployed in school and community center computer labs. His goal is to build highly stable labs that run with minimal overhead. James currently spends his time fixing computers in a garage in the south bay. Cathy Malmrose, our co-founder, often speaks at Linux conferences and travels extensively to see how software and hardware are being used in various countries. She is CEO of ZaReason, a small Linux computer company, building laptops, desktops, and servers running free open source software, shipping internationally. Cathy's main focus is on equalizing people's access to technical tools. Previously, Cathy has worked as a K-12 teacher, a curriculum developer for a software company, and a technical writer for 30+ manuals. Cathy's current passion is building computer hardware and working to support the development and growth of free and open tools. Maile Urbancic, our co-founder, is a community organizer and freelance digital media professional with a passion for helping children achieve their intellectual potential. She has degrees in mathematics and educational psychology, and has taught computer literacy to low-income children for over 10 years. She is also the founder of Boutique Academia, a small business that specializes in math, science, and technology themed accessories for women.